One of the things that makes Cape Town such a great travel destination is it's long summer lasting from November to February and it's 11 hours of sunlight a day. We knew we wanted to skip rainy Autumn and had always had a passion for South Africa so spending three weeks of relaxation, wildlife spotting and taking in the South African culture sounded like the best medicine! Cape Town is a beautiful town especially during this time of year when the sky can't get any clearer. The colours of the blue skies, the white beaches and the turqoise waters make it wasy to understand why the southwestern most corner of Cape Town is called Cape Die Goeie Hoop meaning Cape of Good Hope and did we have some of that for our summer holiday in South Africa! The whole scenery here is just breathtaking, not to speak of the flora and fauna, being a real treat for a couple of travellers like ourselves. 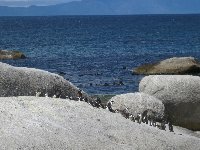 We loved the curious penguins sunbathing on the rocks and the colourful birds in the trees. It's a freat day trip from Cape Town as both places combines you will be able to experience to completely different side of South Africa's capital city. We also visited Robbeneiland in Table Bay which lies less than ten chilometers from Cape Town and is one of the most visited places off the mainland for its great historic value. This prisoners island was where Nelson Mandela was imprisoned during the apartheid era for many years untill he was released from Robbeneiland in 1990. It was a very interesting visit and I guess you can't travel to South Africa without knowing something about its history. It was a very positive experience and today travellers to Cape Town can learn from mistakes made it the past and enjoy the rebirth of South Africa, a beautiful country with so much to offer. 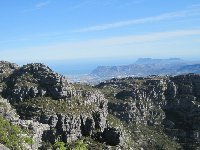 Did you enjoy Cape Town Summer Holiday and have you been on a holiday in Cape Town, South Africa?